Patients are typically admitted to the epilepsy monitoring unit (Children's Hospital or University Medical Center - New Orleans) on a Monday. Antiepileptic medications are withdrawn to encourage the onset of events. On the morning of admission, a technologist applies the EEG electrodes and shows the patient how to trigger an alarm if they think they are having, or have had an event. An intravenous line with a heparin lock is put in place to maintain an injection site in case an antiepileptic medication needs to be administered to stop a seizure. Patients are observed continuously by a nurse using a video monitor. Bedrails are padded and nurses are available within seconds. All patient rooms are private and each is equipped with an extra bed so that if parents, spouses or others wish to stay with the patient, they may stay. The monitoring unit is staffed by experienced epilepsy nurses dedicated to epilepsy monitoring. During monitoring the Epilepsy Center Unit Coordinator provides education about epilepsy and its treatment. After a sufficient number of events have been recorded, appropriate antiepileptic medications are started and the patient is then discharged, typically on a Thursday or Friday. The actual duration of monitoring is determined by the occurrence of events. The goal of the inpatient monitoring is usually to capture 3 to 5 of the patient's typical events. If the purpose of monitoring is to determine if someone is a candidate for epilepsy surgery, then an ictal SPECT scan injection may be administered during an event. For patients who are undergoing monitoring for epilepsy who have had electrodes implanted inside the skull, monitoring is also performed in the epilepsy monitoring unit. 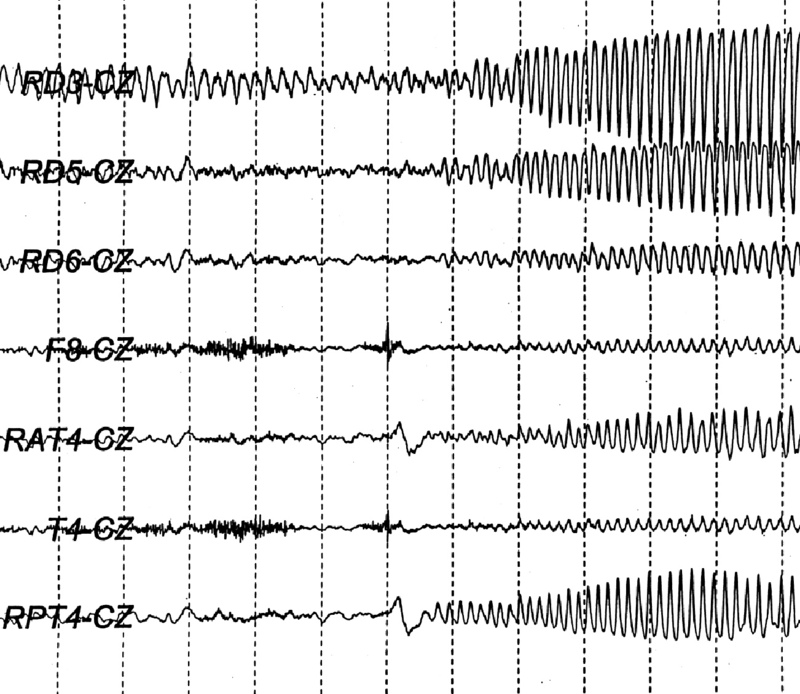 An EEG seizure recorded from intracranial electrodes is shown below (each vertical line marks one second). The rapid waveforms on the right half of the picture below are the seizure activity.